The 12 piece Sigma Professional Brush Set is designed to be of the highest quality to give you all the equipment you need to get a perfectly flawless look. 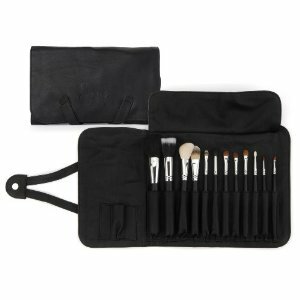 This comes with a protective synthetic/leather look case to store brushes, it is handy for traveling. All the brushes in the kit are made from natural or synthetic bristles, sometimes even a mix of the two. The handles are black and have a silver metal tip to hold the bristles in place, so they should be pretty sturdy even when cleaning. Sigma have also included a free gift with this set, you should get a SS217 eyeshadow brush with the kit. SS150 Large Powder Brush. (for applying powder to face and body). SS190 Foundation Brush (suitable for liquid or cream foundation). SS187 Large duo fiber brush (should leave skin with the airbrushed look after applying liquid foundation). SS168 Large angled brush (Ideal for applying blush or contour shades). SS194 Concealer brush (ideal for concealing imperfections under the eyes). SS275 Small angled brush (used to apply highlights under the brows and the inner corners of the eyes). SS266 Angled eyeliner brush (to apply liquid or gel eyeliner to the upper or lower lash lines). SS252 Large shader brush (ideal for creams and eyeshadow primers). SS219 Pencil brush (to apply color to the crease of the eye lid, outer corner and upper and lower lash line). SS224 Blending brush (ideal for blending colors on the crease of the eye lid). SS209 Liner brush (a firm brush to apply precise lines to the eyes). SS239 Medium Shader brush (ideal for applying loose or pressed eyeshadow to the lids). The majority of users relished the Sigma brush set, even comparing it to "Mac" brushes. They love the high quality they received for the reasonable price of $89 for the 12 piece set. A couple of ladies using the bigger foundation brushes said they experienced some bristle fall out but nothing too major. I think these are worth investing in if you have enough to spare in your budget, you get a full quality set of brushes for a cheaper price than you would pay if you brought them all separately. The Shany Professional Cosmetic 12 piece brush set with vinyl pouch has all the brushes you need for a full makeup application. 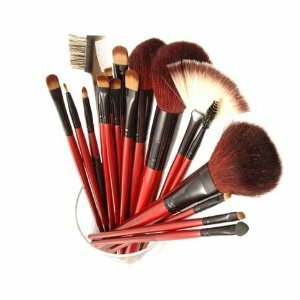 This brush set is made from animal hair, the handles are a lovely cherry red color. The vinyl case can come in a range of colors from silver, black, gold, pink, white and purple. You can try and ring the manufacturer if you want a specific color. 2 Blusher brushes 1 large, 1 medium. The Shany cosmetic brush set has very good reviews overall. Most users find the brushes to be soft and of good quality, they also think the set is very good value for money at $17.99. There are a couple of users who think the set is not very good quality and find the bristles to stiff for their skin. I personally think this is a great kit to start with especially for the low price, although I do agree with one user who is disappointed it doesn't contain a blending brush as I consider this quite a vital tool when doing eye makeup. 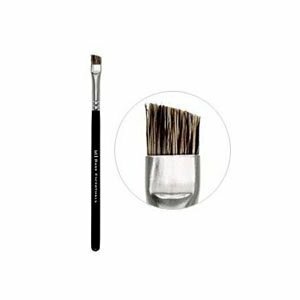 Bare Escentuals Angled Brow Brush is designed for the use of bareMinerals brow color. This arched brush should make it quick and easy to fill brows, leaving them looking natural. It is made from a blend of Taklon fibers and goat hair. When filling the brows I think it is better to use a angled brush as it is more precise and gives a natural looking brow. This brush is also good for applying powder eye shadow along the lash line as a eyeliner. Overall the comments on this brow brush are pretty positive. Most Bare Escentuals fans think it is easy to use and like the stiff short bristles. Some users don't like that it is made from goat hair, they would prefer it to be synthetic. The price is a little on the high side just for a brow brush at $12, but many users agree that it is a good quality brush. 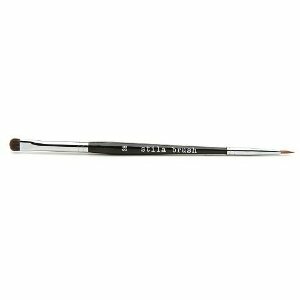 Stila #28 Smudge Pot Brush is a thin brush that is used to apply a thin line along the lash line, while the other end is a bigger brush used to smudge to create a smokey eye. Stila says this brush is designed to be used with Stila's smudge pots, but you can use it for any product really. This double ended brush has good reviews on Sephora. Users say that it has soft bristles, its quick and easy to use and worth the high price. A few ladies found that it worked well but if your using it in conjunction with the Stila smudge pots it becomes a hassle because it needs to be washed every time you use it. Others thought the eyeliner end of the brush was to soft and found that some of the bristles fell out while they were using it. Considering how expensive this brush is it is nothing superior according to most of the ladies that have purchased it. They said some bristles fall out and it's a hassle to wash it after every use. Stila #28 Smudge Pot Brush costs $32. I know that it is a 2-in-1 brush but that is just over priced to me. There are plenty of cheaper brushes out there that will work just as well in my opinion. Colorescience Foundation Brush has a built SPF 20 and it offers refills in 11 different shades. This sounds like a good product. I like the fact it has a built in SPF, this is very important for protecting your skin against sun damage. It is supposed to give flawless coverage that feels weightless and you apparently don't need to use a lot of product. If that's true, that is another plus for this product. Titanium Dioxide, Bismuth Oxychloride, Iron Oxide, Mica. May Contain: Manganese Violet, Ultramarine Blue, Chromium Oxide, Carmine. 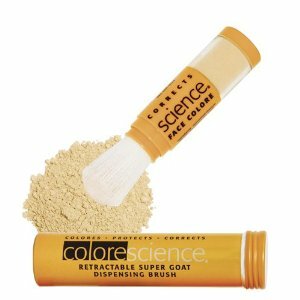 Colorescience Foundation Brush SPF 20 sells for around $60. Which is very expensive but the reviews speak for themselves. I didn't hear any makeup guru's complaining about the price. If its in your budget maybe it wouls be worth while to give it a try. Colorescience have tested it and said it is waterproof for up to eight hours. There are darker shades available so you can use it as a bronzer and foundation in one. You are currently browsing the archives for the Makeup Brushes category.